While President Donald Trump's worldview on a host of fronts has remained fixed since taking office, his view of Paris has shifted. Having repeatedly likened the City of Love to a safe haven for terrorists during the campaign and into the early days of his presidency — a state of affairs he blamed on lax immigration policies — he quickly changed his tone after receiving a lavish welcome from the country's new president, Emmanuel Macron. His visit to France last July included dinner at the top of the Eiffel Tower and a front row seat to the country's spectacular Bastille Day parade. So inspired was Trump by the pomp and fanfare, he returned home and declared his intention to throw a similar military parade in the U.S. The tone of his relationship with Macron himself shifted, too, from a headline-grabbing white-knuckle handshake between the two men early in their tenures to frequent phone conversations to this week's official state visit by Macron and his wife, Brigitte — the first of Trump's administration. Macron and his wife arrived at Andrews Air Force Base on Monday afternoon, and before heading to the White House. The White House will host a dinner Tuesday night in the State Dining Room, at which about 150 guests are expected to attend. The event, entirely planned by first lady Melania Trump, will be a much smaller, more "intimate" affair than an Obama-era event. The dinner, described as American cuisine with French influence, will be served on Clinton-era and George W. Bush-era china. In a break with tradition, no congressional Democrats were invited, although some Democratic mayors and governors are expected. Speaker Paul Ryan is among only four congressional Republicans to receive an invite. There are expected to be few, if any, celebrities in attendance. On Monday night, the first couple took the Macrons to Mount Vernon, home to America's first president, George Washington — a highly symbolic destination for French-American relations. The key to Bastille, given to Washington by Marquis de Lafayette, a French military officer who fought in the American Revolutionary War, remains on display at Mount Vernon. Macron, himself new to office last year, launched an aggressive charm offensive on Trump at a time when most European leaders were bewildered by his boisterous rhetoric and nationalist policies. 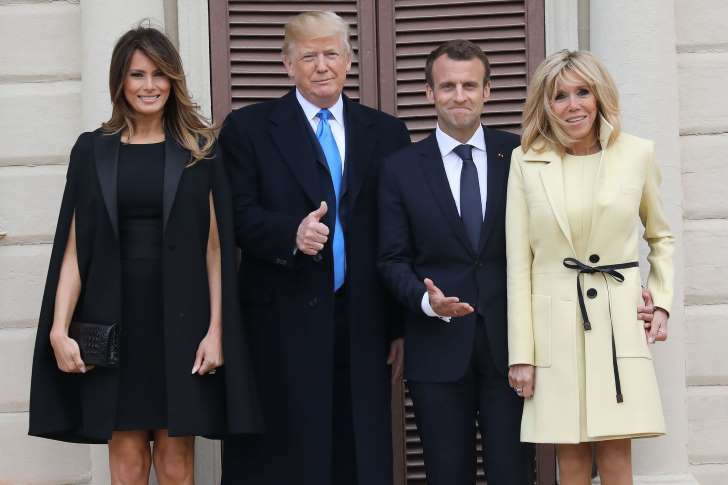 But the French leader, who is the same age as Trump's eldest son, quickly learned that the new American president responds well to tough love. When Trump opted to pull out of the Paris climate accord, Macron delivered an address to the American people in English inviting scientists and entrepreneurs to conduct their research in France. "I do know how your new president now has decided to jeopardize your budget, your initiatives, and he is extremely skeptical about climate change," he said. Macron arrives in Washington with several pressing issues at stake. He wants to persuade Trump to exempt European nations from steel tariffs that are part of the Trump's push to reduce chronic trade deficits with countries around the world — a decision that sent shockwaves across Europe. As France's former economy minister, Macron is a globalist who touts the benefits of multilateral free trade agreements and he is a staunch supporter of a strong European Union. The U.S. is the top destination for French foreign investment — some $19.3 billion in 2016. The U.S. is the largest foreign investor in France, where it invested some $78 billion that same year. Beyond trade, counterterrorism and national security issues will likely dominate discussions. European leaders, including Macron, have been alarmed by Trump's vow to pull out of the Iran nuclear deal. With the deadline fast approaching for recertification of the deal, Macron and his European counterparts insist that Iran poses a greater threat to the world if it is left without formal international oversight and regulation of its nuclear program. Germany and the United Kingdom have also pressed Trump to reconsider the move. German Chancellor Angela Merkel, who is scheduled to visit the White House on Friday, is also likely to lobby him to remain part of the accord. Trump and Macron tend to point to areas where they can cooperate, namely in Syria. This month, the U.S., France and Britain joined forces to target chemical weapons installments used by Syrian President Bashar al-Assad's government against civilians. Among the primary concerns for European allies is containing Russia's destabilizing activities in Syria and across Europe. France is also keen to combat the growing threat of extremism in North Africa — though it has found a reluctant partner in Trump, who has made clear that his preference is to avoid getting pulled in to any other battlefronts. "No one supports the U.S.-led global security system more than Macron and the French political class," said Ambassador James Jeffrey, the Philip Solondz distinguished fellow at The Washington Institute for Near East Policy and an expert in U.S. diplomatic and military strategy. "Macron realizes there is no alternative, so he has to get along with Trump as, with all his doubts about that system, Trump is in charge of it."